Last month Nick Cave published his long awaited second novel, “The Death of Bunny Munro”, to admiration from critics and horror from Avril Lavigne fans. This month sees two special events at the Palace Theatre to mark the publication. 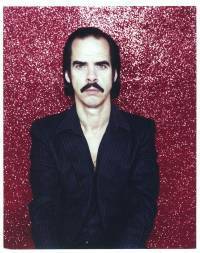 “An Evening With Nick Cave” is described by the great man himself as “informal, intimate and strange”, and promises a mix of readings and live music, with Cave backed by his fellow Bad Seeds Warren Ellis and Martyn Casey. Fans will be also be given a rare opportunity to interact with the shows, as Cave takes questions from the audience. We can only hope he’ll make good use of the “Priscilla Queen of the Desert” props while he's there. If you weren’t lucky enough to get hold of a signed copy of the book at one of his recent signings, we’ve managed to get our hands one to give away to a lucky Londonist reader. Not only that, but we’ve got a Bunny Munro t-shirt to throw in as well! To be in with a chance of winning, simply drop londonist@gmail.com an e-mail with BUNNY in the subject line and your name & number before 5pm this Friday. “An Evening With Nick Cave” is at the Palace Theatre on 11th and 25th October. There are still a small number of tickets left for both nights, costing from £35 and are available here.